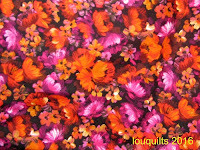 Louisa Quilts: What was I thinking? It all made perfect sense while I was doing it! There was plenty for borders of a quilt, so I proceeded to the scraps for some fabric that would go with it. I was thinking oranges, browns, perhaps? 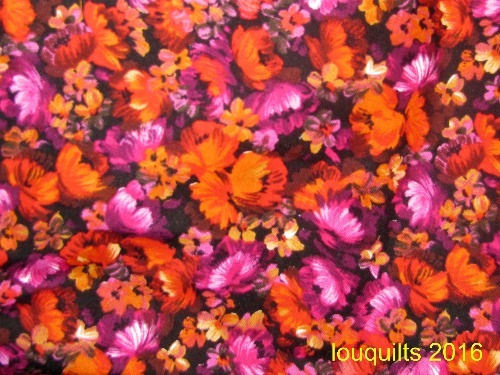 A light print that picks up the gold, some golden yellows, a few red-violets. Not what I expected, but I like it so far. I made a batch of blocks. This was the perfect chance to try out a new quilting book from the library. I had recently been asked to help select some new books for the quilting section. I included Cut and Shuffle Quilts by Jan Ochterbeck on my list and was eager to read it as soon as it arrived. I am always interested in techniques that involve sewing fabric together and then cutting it up again. I found the author's instructions very thorough and clearly illustrated. She includes tips for cutting and piecing that make this a very useful book. My dozen blocks were soon made and I started laying them out on the wall. Dilemma -- I needed another colour in there, and nothing I tried seemed to work. Orange was too -- orange-y. 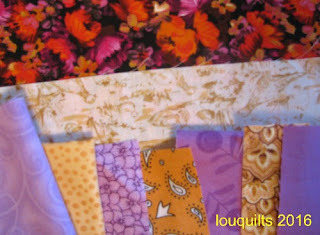 Using the floral print for all the sashing was too much of the same thing, especially as I planned on using that for borders. I finally consulted my colour tools and decided that a nice medium teal-y blue would fit the bill. It would be a complement to all the red-orange that I was seeing. 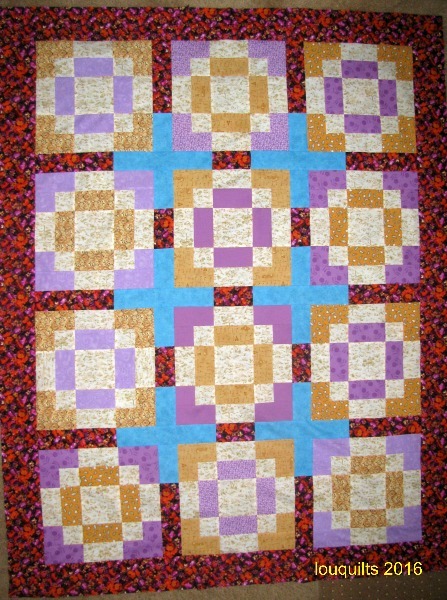 But now that the quilt is all together, I don't know how successful that colour choice was!! The blue plus signs in the sashing seem a bit surprised to find themselves there! Don't get me wrong -- I'm not taking it apart! I think a bit of blue in the border might have helped, but the quilt needed to be this size and no larger and there didn't seem to be room for blue. I don't think a blue binding is the answer, either! But -- as I often tell my friends -- the ONLY time anyone is going to be looking at this quilt and analyzing the colour balance is right now. Once this quilt is finished and wrapped around someone what matters is that it is bright and colourful and warm and full of comfort. Those rather odd bits of blue really won't matter. They do look surprised but happy to be there.